Please join our mailing list to be the first to know about new products, special offers and promotions, and to keep up to date with our latest news. We will never spam you or share your address with anyone. You can expect to hear from us once or twice per month. 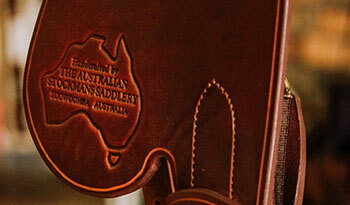 The Australian Stockmans Saddlery is a 100% Australian owned company producing high quality saddles and strapping that horsemen and women around the world know they can trust. 🇳🇿🇦🇺 🎖️Today we honour the sacrifice the ANZACS and all service people have made for the freedom and peace we enjoy today. We also honour their trusty steeds. The preferred horses chosen for cavalry duties were 15 to 16 hands, and had to be good types with the ability to carry at least 17 stone day-after-day. These Walers carried the rider, saddle, saddle cloth, bridle, head collar, lead rope, horseshoe case with one front and one hind shoe, nails, rations for both horse and rider, bed roll, change of clothing, a rifle and about 90 rounds of .303 ammo. The saddles were designed to have interchangeable parts, making them easier to repair, and were constructed on a wooden tree. The Light Horse proved their endurance and hardiness in the Middle East, and are best-known for the charge by the 4th and 12th Regiments at Beersheba in 1917. After a full night's march and full day's fighting, these horses went 48 to 60 hours without water. They galloped across the burning plain to win the battle and eventually water at the Beersheba wells. During WWI, more than 130 000 horses were sent overseas. After the war, one horse made it back to Australia. This horse was Sandy, and he belonged to Major General Sir William Bridges, who did not make it home. The resilience and hardiness of these amazing horses live on in the modern day Australian Stock Horse. Listed below are the trading hours at our Adina World Cup site, iOR Morgan Park, Warwick. Celebrating 80 years of polocrosse in 2019, the Adina Polocrosse World Cup 2019 will bring players from eight countries – Australia, New Zealand, South Africa, USA, UK, Ireland, Zambia and Zimbabwe - to southern Queensland to see which team reigns supreme. Australian Stockmans Saddlery if the Official Saddler of the Adina Polocrosse World Cup 2019. Visit us from the 16th to the 28th of April 2019 at IOR Morgan Park, Warwick. Australian Stockmans Saddlery will be attending the Cunningham Polocrosse this Saturday 13th April from 7am until late afternoon. Come and visit our site for all of your saddlery needs at Chinchilla this Saturday 6th April from 7am until late afternoon. Phone and email orders most welcome.